Ginseng has a long tradition of use in traditional Chinese medicine, where it is utilized to treat a variety of conditions and ailments. 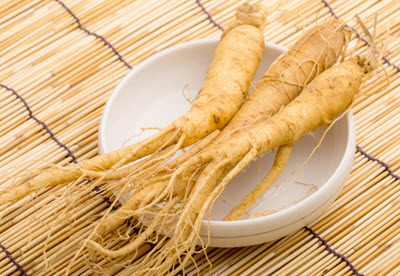 Ginseng is the root of plants belonging to the genus Panax in the family Araliaceae. The botanist Carl Linnaeus gave it the name Panax since he was aware of its wide use in Chinese medicine. In Greek, panax means “all-healing” and is an allusion to Panacea, the Greek goddess of universal remedy. Members of the genus Panax are characterized by containing ginsenosides and gintonin. Wild ginseng is generally more expensive than cultivated ginseng, and highly sought after by practitioners of traditional Chinese medicine. In Chinese, it is known as sansam, which means mountain ginseng, and professionals gathering wild ginseng are called simmani. Cultivated ginseng is less expensive than its wild counterpart and much easier to find in the trade. In China, it is called insam, which means human ginseng. A middle-road between wild and cultivated ginseng also exist in China, and that type of ginseng is called jangnoesam. To produce jangnoesam, Panax plants are purposely planted along the mountainsides and left there to grow as if they were wild, until it is time for harvest. Each year, approximately 80,000 tons of ginseng is produced. The four main producers are China, South Korea, Canada, and the United States, with China representing well over half of the total production. South Korea produces around 25,000-28,000 tons per year, but only of native South Korean species. Canada accounts for roughly 6,500 tons and the U.S. for slightly more than one ton. South China ginseng P. notoginseng A warm-climate species native to south-western China and Vietnam. Korean ginseng P. ginseng A cold-climate species native to the Korean Peninsula, north-east China and Russia’s Far East. American ginseng P. quinquefolius A cold-climate species native to Canada and the United States. Vietnamese ginseng P. vietnamensis Native to Vietnam, and a small part of southern China. Grows under jungle leaf canopy and near running water, at altitudes above 1,200 meters. Fresh ginseng is highly sought after by connoisseurs, but it can be difficult to find in ordinary shops and it is pricey compared to dried ginseng. In Chinese, it is called susam, which means water ginseng. Fresh ginseng is sometimes referred to as green ginseng. White ginseng is a type of peeled ginseng. In Chinese, it is called baeksam which means white ginseng. To make white ginseng, fresh ginseng is peeled but not heated up. The peeled ginseng is dried until the water content is 12% or below. A traditional drying method is to air-dry the ginseng in the sun, which bleaches the root to a yellowish-white shade. Red ginseng is another form of dried ginseng. In Chinese, it is known as hongshen which means red ginseng. Unlike white ginseng, red ginseng has not just been peeled but also steamed before being dried. It is dried in or out of the sun. Red ginseng is commonly stored in an herbal marinade. This way of preserving the root makes it very brittle.